Having herself had an Australian education, our founder Lina Ashar's first steps into setting up a play-school for children were met with enthusiasm and encouragement. It laid the foundation for the first Kangaroo Kids play school. The key idea was to set up a learning space for children, where they could grasp concepts and ideas, through fun and engaging exercises. There were hardly any nursery schools or play schools in India following a similar approach. Our goal was to change the mental model of schooling (rote-learning, unhealthy competition, stressful examinations) and in the process, we changed the teaching-learning cycle by allowing children to be thinkers, innovators, lifelong learners and problem solvers. I believe that in the real world Emotional Quotient (EQ) is more important than Intelligence Quotient (IQ) to be a successful human being. With all the support and conviction what started out as a journey in a 600 square feet space in Bandra, is now a success story that has touched more than 1,00,000 children’s lives. Not only has it been counted among the best play schools and nursery schools of India, but it has created 100 plus entrepreneurs as partners of this vision. Many of our partners are parents who joined our journey after experiencing the impact that Kangaroo Kids had on their own children. 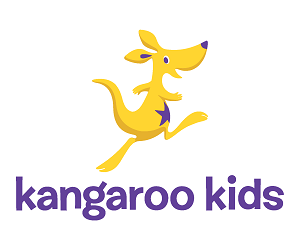 At any Kangaroo Kids play school in India, your child gets multiple opportunities to master various concepts, which are taught through art, music, play and experiential methods. 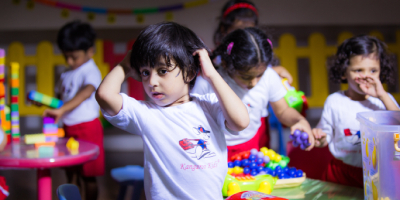 Based on neuroscience research and adapted from some of the finest teaching systems internationally, the Kangaroo Kids curriculum has set new benchmarks for other play schools and nursery schools in India. The unique programme is a new concept in learning and incorporates path-breaking brain research. In the last 25 years, more than One lakh children from Kangaroo Kids have grasped concepts easily and effortlessly. The unique teaching system is one of the reasons that by Junior Kindergarten (Preschool Year 3); your child will be a proficient reader. Different reading strategies are used to help your child decode words. Strategies like recognising letters and decoding words using rebus clues are used for visual learners, rhyming words - auditory learners; sandpaper letters and walking on letters for kinaesthetic learners. Kangaroo Kids Club facilitates action based learning in a fun filled environment. The sessions are specially designed to encourage the exploratory side in toddlers and provide multisensory stimulation through visual, auditory and kinaesthetic (touch based) programmes. Each session is carefully monitored to maintain safety standards and to allow individual toddlers to achieve their maximum potential. KKEL is among the first in India to offer a Mother-Toddler interactive programme. Action-based learning is elevated to the next stage using innovative teaching methods. 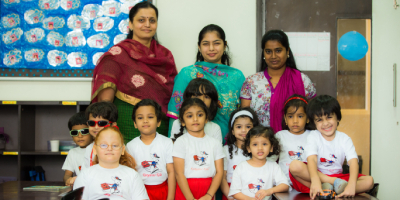 Compared to other play schools and nursery schools of India, Kangaroo Kids Preschool is recognised by mainstream schools as an institution that produces confident, creative and eager learners.